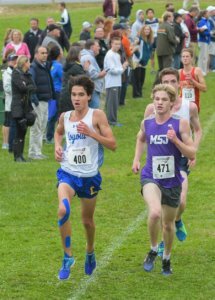 COCKEYSVILLE – After two years of taking a backseat to Mount St. Joseph at the Maryland Interscholastic Athletic Association championships, the cross country team from Loyola Blakefield resumed its customary position Nov. 1. The Dons held off the Gaels, 60-67, at the MIAA championship meet at Oregon Ridge. It was the 15th MIAA or Maryland Scholastic Association title in 33 seasons for coach Jose Albornoz, whose program won six straight from 2009 to 2014. Then, Loyola Blakefield had stars such as Matt Jablonski, who went on to the University of Oregon and won the half-marathon at the Oct. 21 Baltimore Running Festival. Now, the Dons have a lineup that is still a year from peaking, as their first four finishers, Camden Gilmore (fourth), Connor Verrett (sixth), Kyle Clarke (11th) and Ronan Sullivan (19th) are all juniors. What it lacked in experience, Loyola Blakefield made up in motivation. The Dons went down in a collective tumble at the start and never recovered in last year’s championship race, and there was the matter of a one-point loss to Gilman during the A Conference regular season. 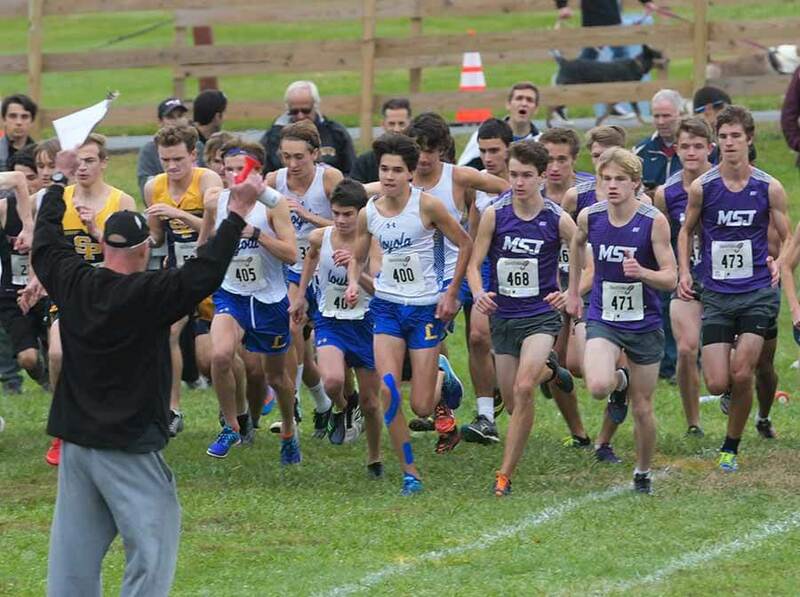 The Dons were hardly a lock, as Albornoz, hobbled by an old knee injury, gamboled to the eastern stretch of the 3.1-mile course during a race in which a challenge from St. Paul’s added to a nervous afternoon. Dan Quets (20th) was the other scorer for Loyola Blakefield, which dealt with a number of injuries this season, including one to sophomore Paul Macdonald. 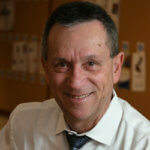 A math teacher, Albornoz’s own education includes the former parish school at St. Charles Borromeo, Mount St. Joseph and what is now Loyola University Maryland. The Gaels got a third-place finish Hunter Petrik and a seventh from Andrew Brinker. Calvert Hall’s Owen Johnson finished fifth in a race won by McDonogh’s Dalton Hengst. The meet came one week after girls from Catholic schools dominated the Interscholastic Athletic Association of Maryland championships at Stevenson University. 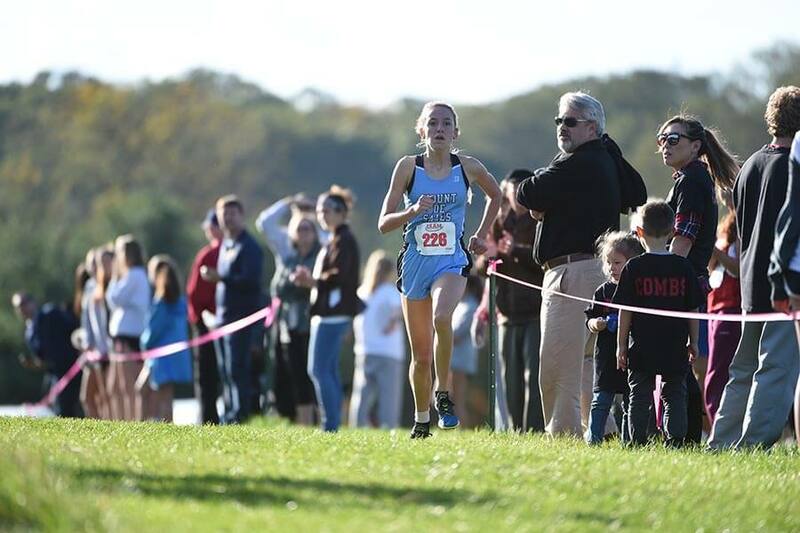 Samantha Facius, a junior from Mount de Sales, finished the 3.1-mile course in 18:58.54, 17 seconds ahead of sophomore Lacey Eden, whose runner-up finish paced a team title for Archbishop Spalding, which is coached by Mike Ward. The Cavaliers, who lost to Maryvale Preparatory School by one point Oct. 11, edged the Blazers at the championship meet, 52 to 67. Spalding’s other scorers were sophomore Allysa Combs (fourth), Kate Oravec (12th), Maddy Sampson (13th) and Sara Swanlund. Notre Dame Preparatory got a third-place finish from Julia Merriman and came in third in the team standings. To view more photos from the boys championship, visit our Smugmug page here.